Good morning everyone! It's Monday isn't it? Days are getting busier for me. I will still try my best to churn out comics weekly. Here's a four paneled one today. 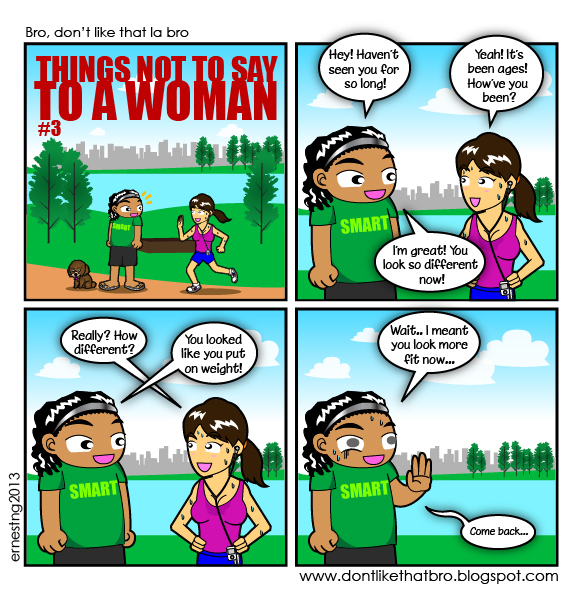 Pretty standard humour but let's revisit the "Things Not To Say to A Woman". "I have no idea. Stop asking." The bros are going to die alone for sure. What are the things you have said to a woman but wish you didn't? Let us know in the comments below. So that we know we won't die alone. Sensitives issues for women right..
ya meh? i tot they will hate it too. the bros are walking fails waiting to happen. yea, "put on weight" is a big NO-NO. LOL! yeah. he should have rephrased it sooner. wah! haha dam badass la u bro! Really, why did you put 3 on the 1st place? Of cos we will be wondering where 1 and 2. Once i said to long lost contact girl .. "Y did u look a lil bit old now?" What did i serve after? A sour face and ended with F U! Silly me!
" hey pretty, your makeup makes you prettier than usual today "
" do you miss your beautiful long hair? It was indeed beautiful and made you perfect. Oh, your short hair look now is good as well "
"Why are you so emotional today? Period kah?!" omg that one seriously mengundang bencana! There are few of us out there who would smile if you say we put on weight, as we are the bunch that are desperately trying to gain weight, hahaha, so it doesn't apply to all. haha true. but you skinny ma so tak terasa. I just generally find girls dont like being called fat. Never say the taboo words to girls. Especially when they are in a bad mood. especially during the time of the month? Yup. It can be even worst that normal. hahaha. If you become my gal, you can help me do laundry & clean house too!" Or words like "it's a girl's job to cook/clean/follow everything the man orders..."
Turns us, girls off. We ain't your mum/maid. We girls used to laugh at those guys who said that. It's like day work hard; night work harder lol. Of course it's good to find a motherly gal but this type of wooing method - Fail! Oh I hate it when guys relate everything to us girls 'having periods'. Bad mood = period, Emotional = period, Don't wanna go out = period, and the lists goes on. never talk about weight with woman . including my mom. haha . NEVER EVER SAY TO A GIRL THAT SHE'S FAT/PUT ON WEIGHT!